This is for your students AND you/your staff. It's a new school year, and like I said in my last post, your schedule will probably change 800 times in the first month. No matter how many times your schedule changes, coming back from summer vacation can be hard on our little guys. Going from a lot of unstructured time to structure can be a big change in itself. This is the time when we work hard on classroom expectations, our schedule, learning the different areas of the classroom, etc. I've been blessed the last few years to have many of the same students, but this year I was moved buildings and have a brand new caseload of little ones! We will be spending a LOT of time those first few weeks on learning the routines, the building, and each other! Get your data sheets out and ready. This is the time to take baseline data for the year. It's a great time to see what your students have retained over summer and what you might need to work on a little extra over the next few months. Your future self will thank you when progress report and IEP time comes around! This is also a GREAT time to get to know your new students strengths and what you need to work on over the course of the year! Don't believe everything you read in an IEP, I have had countless situations of IEPs coming to me that were way off base. HERE are some of the data sheets I use over the course of the school year with my students! I also like to give my parents these forms at open house to see what life skills based skills they can do at home. 3. Building independence in the classroom. This one ties in with number 1, but it gets its own section because I believe it's super important! This is the time to build student independence in the classroom and get them used to the way YOU run things. Maybe they've never had to do independent work or centers. Do you want to hit them with new skills? NO. This will only cause unnecessary behaviors. The first few weeks is when I give them activities that they already have mastered so they can be SUCCESSFUL. You might feel a little guilty like you aren't "teaching" them anything, but trust me on this, do NOT feel guilty. You want them to feel successful throughout the day and this is the time to do it! If they have letter identification mastered, awesome! Hit them with a bunch of letter ID work in your independent stations or whatever you might do in your classroom. They will be happier and so will you! After they have the routines and stations down, THEN you can start introducing new skills! I'd love to hear what YOU do in the first few weeks of school with your students! Leave a comment below and let me know! 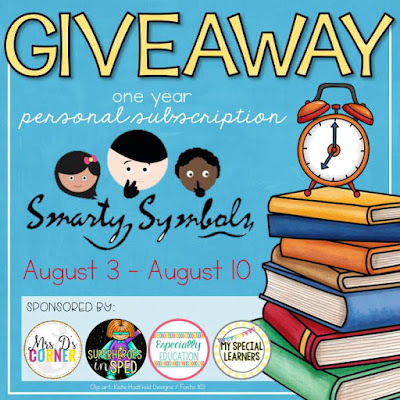 ALSO - after you check out all of the other blog posts about the first two weeks of school, head on over to my Instagram @myspeciallearners to find out how you can win a ONE YEAR personal subscription to Smarty Symbols! You are sure to LOVE this for your special education classroom!! 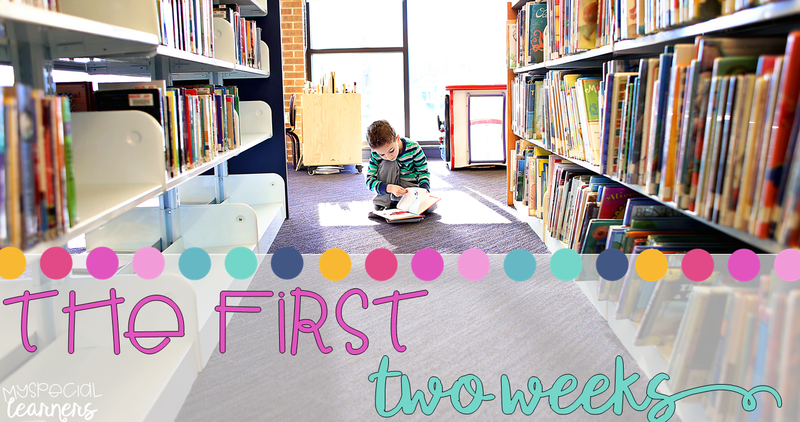 Click below to hop on over to Stephanie at Mrs. D's Corner to hear about how she plans for the first two weeks! Creating independence in the classroom is so necessary for a successful school year! YES! Yes yes yes to all of this! Independence is what we strive for!